Drifters Wife started as a wine shop, Maine & Loire, in 2015, when owners Peter and Orenda Hale planted their flag as Portland’s champions of natural wines. 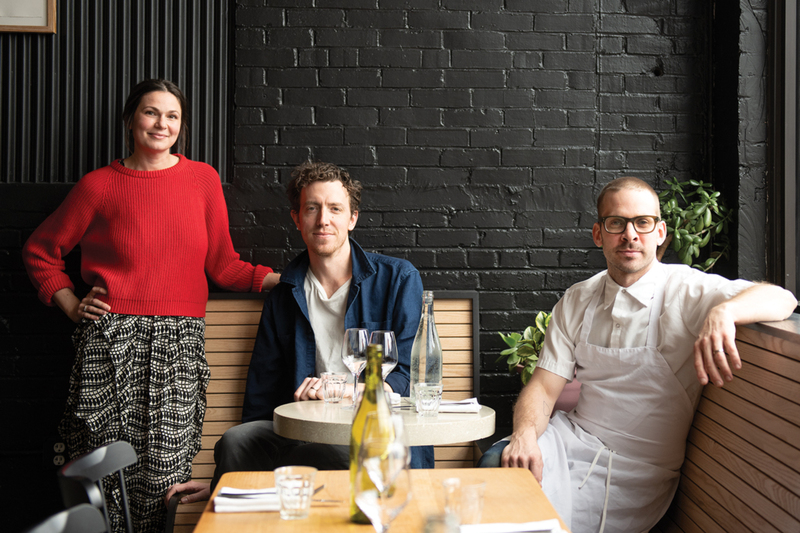 About a year later, they moved the shop to the rear of their space and opened Drifters Wife up front, hiring chef Ben Jackson, who created a small but ambitious menu intended to perfectly complement a knockout wine list. Maine & Loire stayed open throughout dinner service, so shoppers often wandered right past the tables. 59 Washington Ave., Portland. 207-805-1336. Starters and small plates $6–$16, large plates $26–$34. Drifters Wife moved into the former Roustabout restaurant space, complete with a full kitchen. Now, chef Ben Jackson no longer has to cook with only a pair of induction burners and a small convection oven. Time for a pre-dinner drink? Grab a beer at Oxbow Brewing Company, a gin cocktail at Hardshore Distilling, or mead from Maine Mead Works — all on the same block as the restaurant. Small as it was, Drifters Wife clicked; Bon Appétit included it on its 2016 list of the country’s best new restaurants. Then, last December, the Hales opted to move their whole operation into a much larger space next door, building a separate space inside for the wine shop. “It was the first time I really started referring to Drifters Wife as a restaurant,” Peter Hale says. Jackson now has a full kitchen to work in — and a supporting kitchen staff — which lets him offer a larger menu than before. Loyal diners will still find their old favorites, like sourdough bread with dulse butter or Israeli milk pudding with cashews, but the rest of the menu changes with the seasons and the chef’s whims. Highlights on recent visits included a seafood stew with turnips, lentils, and yogurt and a lamb dish with buckwheat, olives, and feta. Any seafood dish is a smart order. On any given night, Jackson might be working with hake, butterfish, or monk, but no matter the fish, he has a gift for hitting just the right temperature for perfect flavor and feel. The luxuriousness of the textures he creates ought to win over even the most devoted carnivore. Of course, there will be wine, offered both by the glass and by the bottle in the shop, which diners can carry over to their table. The Hales love wines made from grapes farmed organically, hand-harvested without the aid of machines, and fermented with native yeasts. But the shop’s tasteful simplicity and the evident care that’s gone into the inventory keep the natural emphasis from feeling gimmicky. Those practices give wine a superior character and complexity — and with the retail shop onsite, there are none of the hefty markups many restaurants work into their wine lists. It’s that interplay of two sincere passions, for wine and for food, that defines an evening at Drifters Wife. “With the wine shop right inside the restaurant,” Peter Hale says, “I like to joke that we’re our own next-door neighbors.” The shop would be superlative without the kitchen, the kitchen first-rate without the shop, but together, they’re even better.